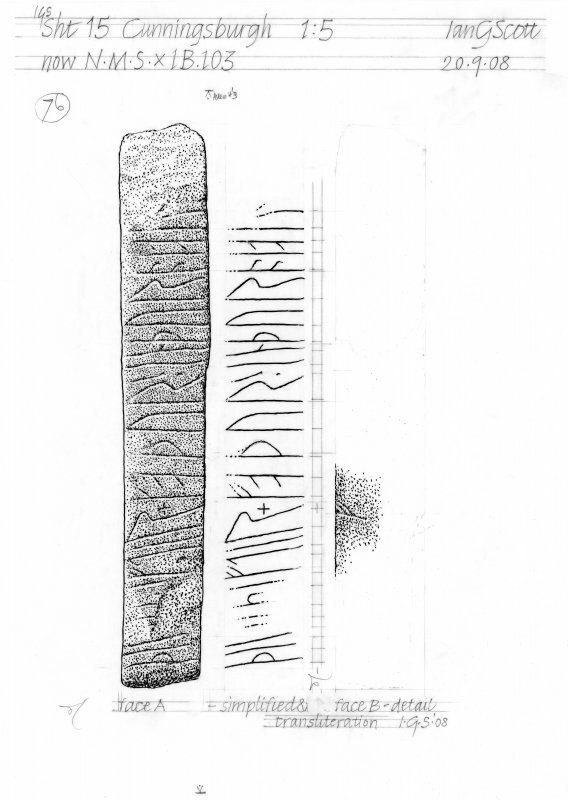 Drawing of carved stone with runic inscription. Cunningsburgh Mail. 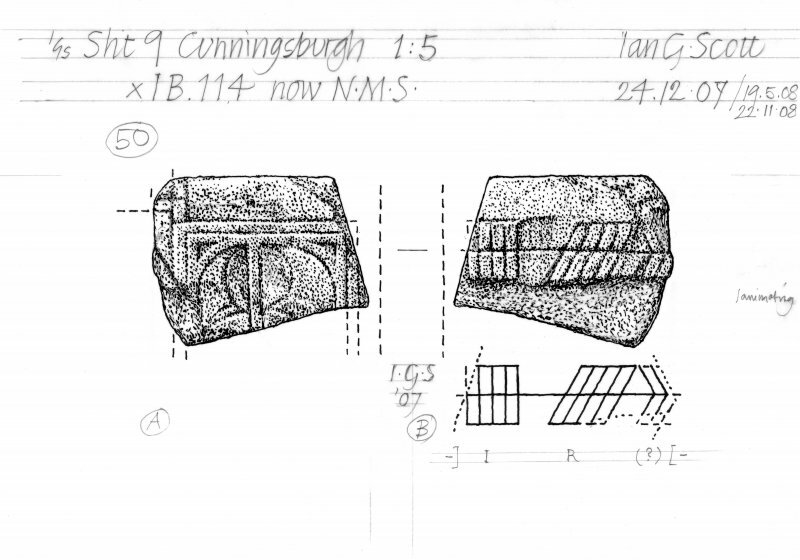 Measured drawing of slab bearing incised figure of animal-headed man. Digital copy. 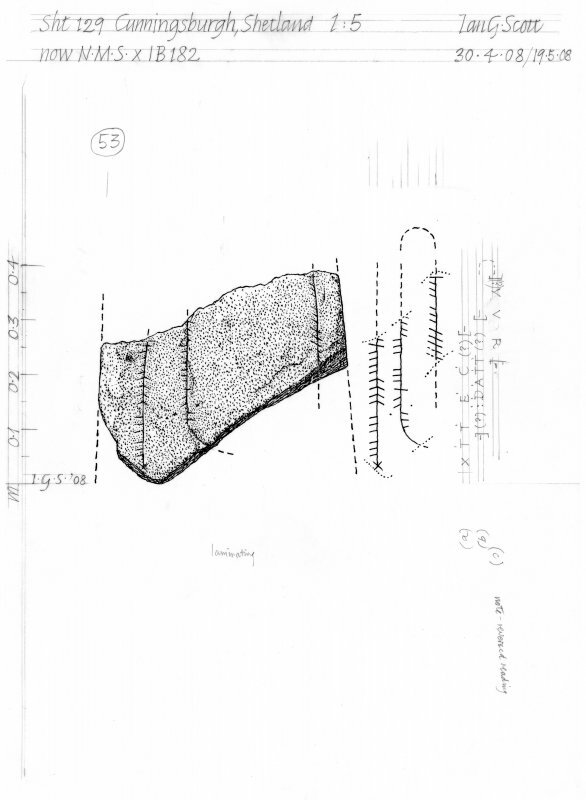 Drawing of a carved stone with Ogham inscription. Cunningsburgh, Shetland. Evidence for discovery: found in the 1960s during grave-digging in Mail cemetery and built into the churchyard wall. It was lying loose in the graveyard when it was re-discovered there in 1992. Present condition: the top of the slab appears to have been crudely dressed, while the lower edge is broken. Firmly incised on one broad face of this slab is the formidable man symbol. The figure is 0.44m high and faces right, it depicts either an animal-headed god or a human wearing an animal mask. The head has a long snout with bared teeth and a large oval eye, and a beard seems to emerge from beneath it. Some sort of headdress covers from the forehead to the shoulders. 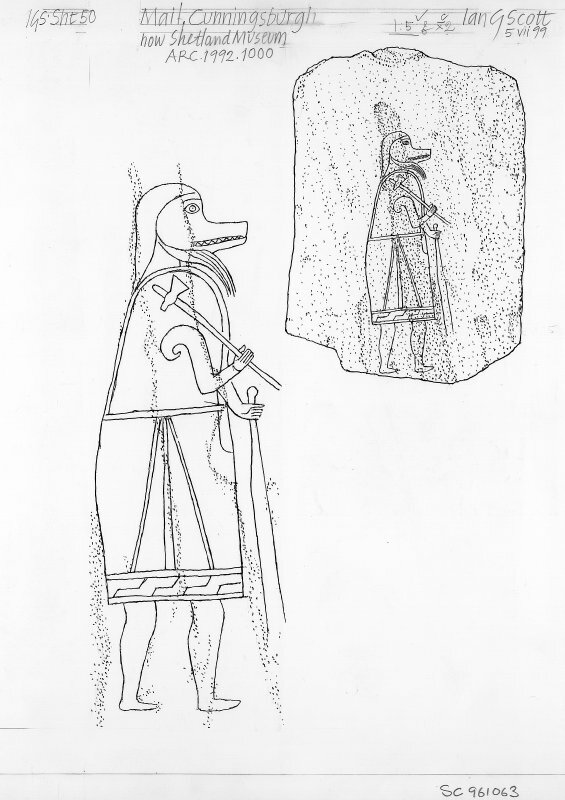 He is carrying a club in his left hand and an axe-hammer in his right hand, resting against his right shoulder. He is wearing a tunic reaching almost to his knees, with a gored skirt and a hem border decorated with step pattern. References: Turner 1994; Scott & Ritchie 2009, no 6. Evidence for discovery: found by a crofter while removing stones from the site of the broch at Mail and given to the museum in Edinburgh in 1923. Present condition: damaged at the front of the base and some facial damage. Shaped into a cone, this was then carved to depict a human figure dressed in a full-length robe with a hood, with only the face visible. With slits for the eyes and mouth and a flat, squared-off nose, the face looks brutal or mask-like. References: Ritchie et al 2006, 61–3; Scott & Ritchie 2009, no 14. Proposed date c.750 AD 44.2cm high. 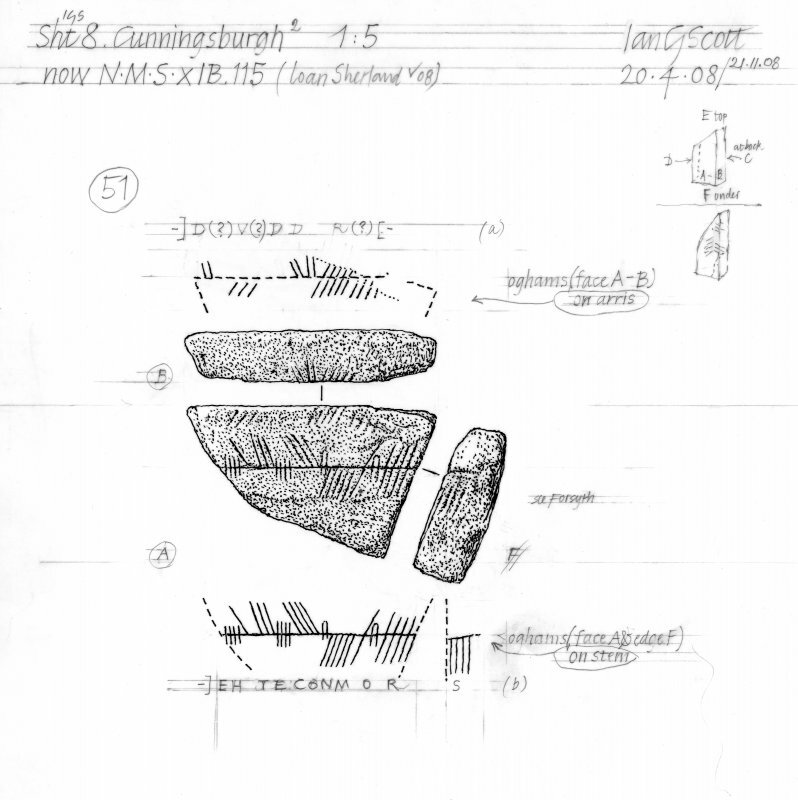 Information from Ms V Turner (Shetland Islands archaeologist), 13 August 1992; visited (V Turner), 5 August 1992.